Here comes the Hanukkah Man!! On my birthday we went to lunch at one of my favorite places in Charlotte, Cuisine Malaya - you have to try the mango shrimp, the crispy duck and the roti canai appetizer! Then Dad, Diane, Patrick and I saw the movie "Blood Diamond." 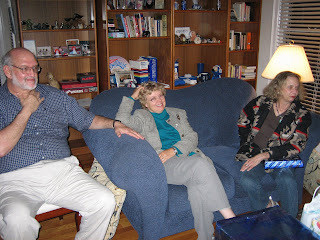 Later on we went to a fabulous holiday party at a family friend's house before heading back to my dad's house for my quarter century birthday party. 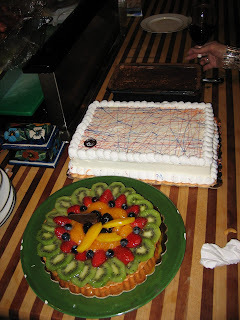 I had to try the fruit tart even though I knew my birthday cake was waiting at home! 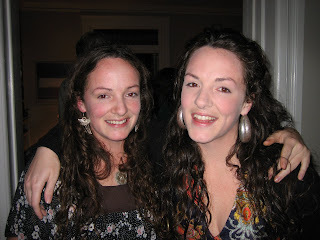 Liz and Anna - forever "the twins." 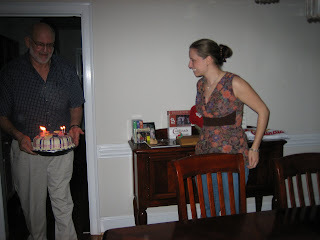 Dad bringing in the cake! 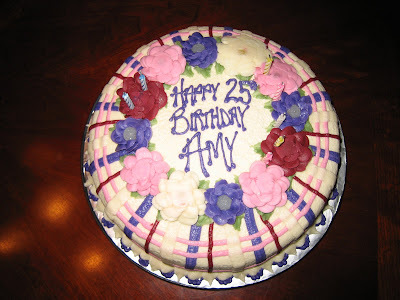 Amy takes charge and cuts the cake - it was lemon cake with a homemade raspberry filling. 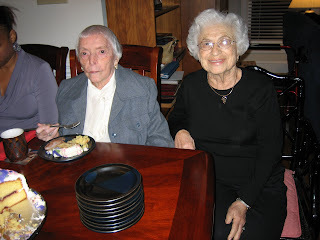 My two grandmas - Bea and Sarah. 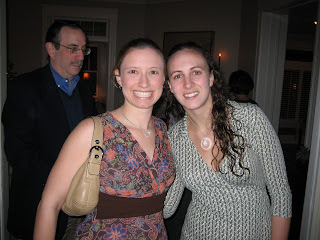 After the trip to the mountains we drove down to Atlanta to attend my new law firm's holiday dinner. 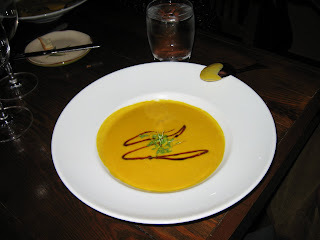 The dinner was held at Woodfire Grill, a restaurant specializing in grilled organic meats and local produce. 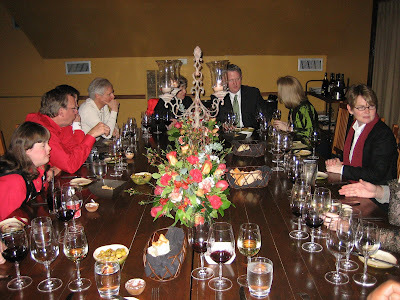 We had a wonderful meal with great food, great company and great wine! 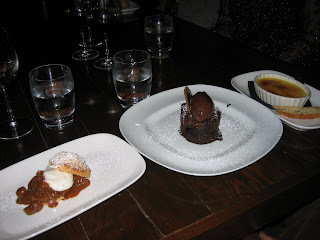 Below are some of the dishes we savored throughout the evening. 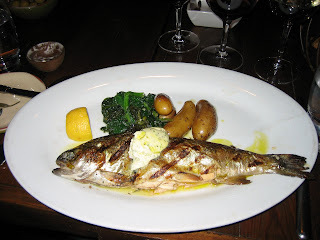 This whole trout was excellent - even with the eyes staring me down! 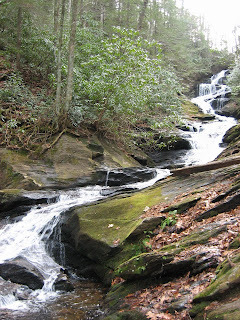 During the trip to Charlotte and Atlanta we managed to make time for a quick trip up to the NC mountains. 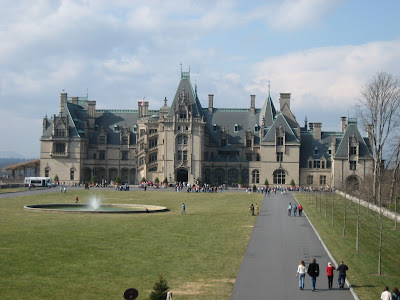 We toured the gorgeous Biltmore Estate and tasted some wines at the winery that is located on the grounds. The unseasonably warm weather only added to the delight of being in such a lovely place. This was also an opportunity to go back and see my beloved Camp Celo, the Quaker camp I went to every summer for six years of my childhood, and our mountain house, which is located only about a mile from the camp. We even cooked dinner there, as you will see below. To me, the air always smells better up in the mountains and I look forward to visiting every time I get the chance. 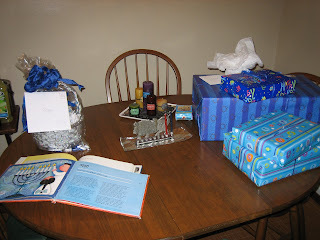 The Hanukkah Table in Williamsburg - ready for night 1. 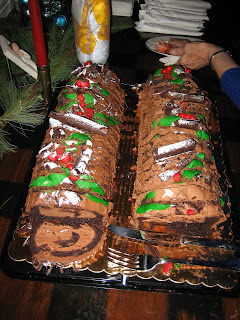 This year Hanukkah started on the evening of December 15 and continued until December 23 (also my birthday)! 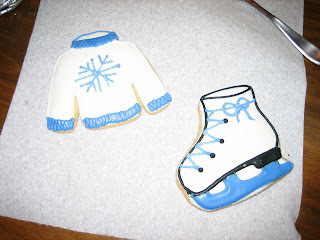 Melanie gave me some really cute cookies in a Hanukkah holiday basket. 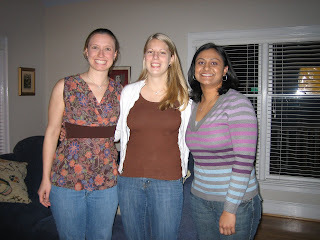 We were in Charlotte, Asheville and Atlanta during our vacation week - and we did A LOT! Actually, it was more of a busy, busy week than a vacation, but we still had a great deal of fun seeing everyone and travelling around. My Dad got a new Ozzie Smith jersey. 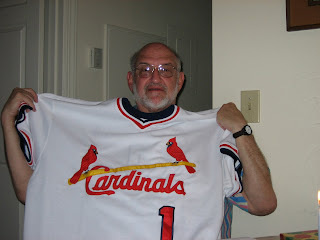 As you might guess, Dad's favorite team is the St. Louis Cardinals. 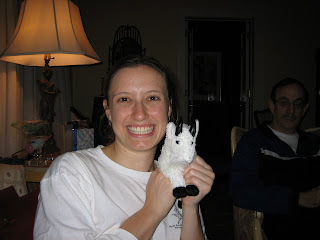 One of my favorite gifts, a goat donated to a needy family through the Heifer Project and a matching stuffed goat to symbolize the donation. 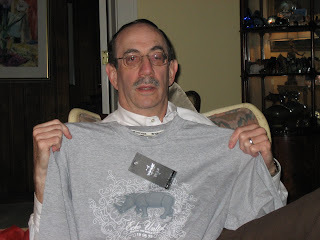 Steve with his new Ecko shirt - see the rhino? 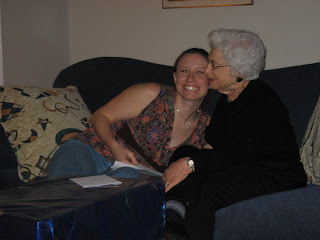 Later in the week we enjoyed a wonderful Hanukkah party hosted by my Grandma Sarah at her Fort Mill, SC home. 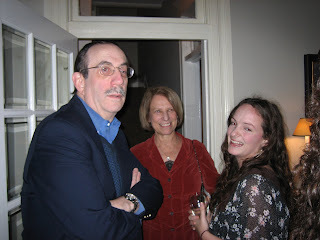 We saw lots of family members, ate potato latkes and had an all-around good time. 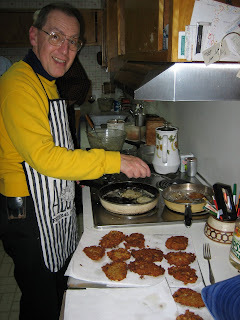 Family friend and mah-jongg player Howard making latkes at Grandma's house. 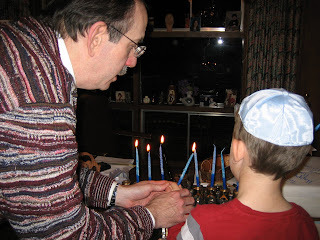 Steve helps cousin Dylan light the Hanukkah candles. 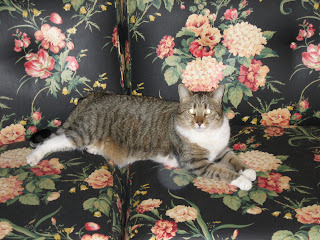 Grandma's cat (formerly belonging to Bernie, Teri, Jason and Adam) Pillow reigns supreme. Overall we had a great Hanukkah! 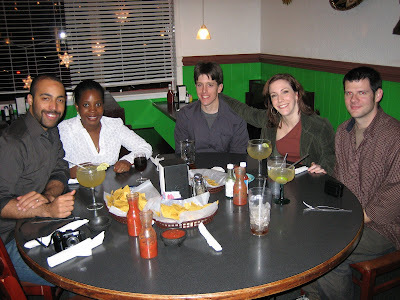 Every semester after our exams are over, some of my law school buddies and I have a tradition of going out for Mexican food. We started out going to Casa Maya but since they changed locations and, in our opinion, faltered on the food, we have come to prefer South of the Border. After our Spring exams one year the Mexican food tradition turned out to be quite longer than we expected - it happened to be that our exams were over on Cinco de Mayo, apparently the day when people who forget about Mexican food during the rest of the year decide they need to have Mexican food. Anyway, this year we had no problem getting seated (we went on December 14) and we ordered margaritas to celebrate. I had the shrimp soup and a side of guacamole (love that stuff!). My usual order at South of the Border is Tacos de Carne Asada on corn tortillas - great stuff but a little more than I wanted this time. 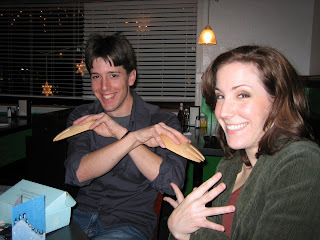 Justin and Nathalie with their new bear claws AKA serving instruments. Just wanted to put in a little post since it has been awhile. 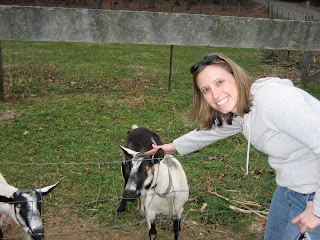 Great news is that I am moving to Atlanta to begin my dream job after graduation in May. I am really excited for the job and the town. Should be some great food opportunities down there and when I find a moment I want to take some cooking classes for sure. Tonight I had some fabulous sukiyaki at Kappo Nara - I hadn't had any since I was in Japan and it brought back some great memories. For those who don't know, sukiyaki is a beef, mushroom, tofu, scallion and noodle stew with a rich borth. 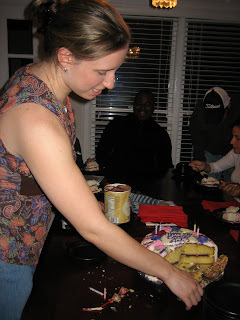 This is also the season for latkes, Chrsitmas cookies and birthday cake (for me!) so we will be enjoying all of that soon. I will try and be a better poster in days to come, meaning, after exams are over!